The harsh Australian sun commands respect. Shade solutions for home or business are imperative, but that doesn’t mean you have to settle for something old-fashioned or unattractive. At Aussie CoolShades our shade sails are a stylish alternative that offers protection from the sun and simultaneously makes a positive statement about the owner. Shade sails are a flexible shade solution utilizing durable high quality knitted cloth. They can be crafted in a wide variety of colors to compliment any home or business. Attached to anchor points with marine grade hardware, shade sails take on a nearly endless array of shapes and orientations that truly set them, and your building, apart. The overall quality of a shade sail depends on excellent planning and design, and likewise, on high quality components. No part of the properly deployed shade sail is more important than the posts. Shade sail posts dictate the shape and positioning of your sail, and they are critical to its long-term wear and appearance. Said another way, a poor quality post, poor installation, or both will lead to an inferior solution and wasted money. Several considerations are key when thinking about shade sail posts. First, pick posts constructed from quality materials. Most experts recommend heavy gauge steel posts. Wooden posts are another alternative, but they lack the uniformity and long-term ruggedness of steel posts. Additionally, wooden posts are susceptible to weather, pest and ground damage, all of which can lead to poor tensioning of the sail fabric. Steel posts, on the other hand, are durable, uniform, easily painted, and perfectly suited to the chore of providing a stable anchor for your shade sail over the long haul. A second consideration when planning your sail is proper positioning and installation. Post placement must be carefully considered, and for the best results, measurement should be precise. Shade sail posts should be secured effectively by sinking a full third of their length in the ground. Concrete footings are a must, and for the best sail tensioning, posts should be leaned away From the sail at roughly a 5% angle. With quality material, careful planning and measurement, and proper installation your sail will prove to be an attractive and valuable part of your home or business for many years to come. 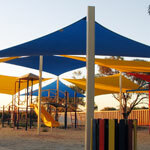 Contact Aussie CoolShades to find out more about our shade sail posts and other shade sail products.